There’s something about winter that makes us want to hunker down and get cozy—and that’s exactly the vibe we’re getting from January’s Product of the Month. Brand this drawstring backpack and you’re good to go anywhere winter calls. The perfect carry-on, weekend bag or road-tripping pack, this is the ultimate seasonal must-have. Not only is it sleek and durable, but its “puffy” factor is sure to stand out in a crowd—and sure to draw lots of added attention to your brand. Looking for an even bigger “wow” factor? Fill this quilted drawstring backpack with additional premiums, promotional items or even your latest proposal and pop it over to your client. There’s no way this delivery will go unnoticed, or won’t drive a “follow up” on the spot — bonus! This puff packs a serious punch. With a built-in pouch, this go-anywhere, do-anything quilted tote bag is an ideal bag to load up with some post-slope snacks or a thermos of hot cocoa. And because it has durable straps, it’s easy to grab and go — wherever “go” takes you this winter. If there was such a thing as a cozy Koozies, this would be it. This puffy insulated can cooler keeps drinks ice cold — as if the single-digit temperatures won’t. 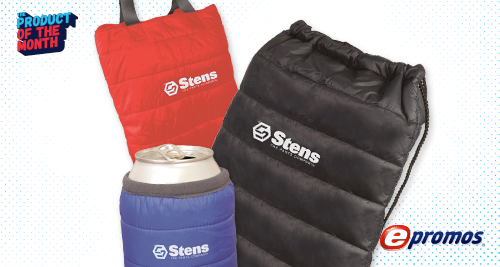 Available in black, blue and red with an oversized imprinting area, your brand or brand message will pop against any snowy backdrop—and, equally important, ensure your seasonal sips are the perfect temperature whenever you need a drink. Many of these cold weather essentials have already popped to the top of our clients’ winter wish lists — and with good cause. Consider them the puffy coats of the promotional item landscape, and the products you want hitting your clients’ and contacts’ desks in the New Year. Get in touch to learn more about our exclusive “puffy” collection. Missed our Product of the Month from December? Check it out here.